This is a month of celebration for Double H #Multibrand Fashion Agency – after a successful succession of trade shows we are honoured to have Bertoni of Denmark featured in the latest issue of MWB magazine. The trade title, published nine times a year, focuses exclusively on menswear and serves as a reference to traders as well as agents and buyers. In a stunning editorial called Tailor Made styled by MWB editor Victoria Jackson, the shoot is a showcase of next SS’16’s key pieces in menswear. Elegant pieces with a modern twist, ferociously fashion-forward jackets, statement prints… there are many exciting elements surrounding menswear next spring and summer, and Bertoni of Denmark is one of the clear leaders of what’s to come. 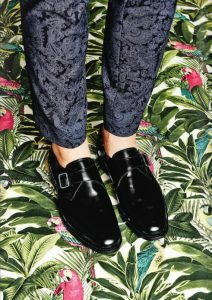 One of the brand’s star pieces, the navy paisley print trousers, are displayed in all their glory in the editorial piece. Another of the brand’s key separates, a pair of hip navy fold-up trousers are beautifully styled in the amazing editorial. 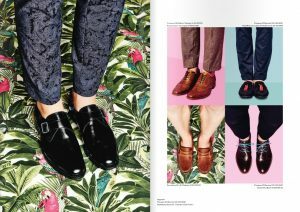 Don’t miss out on this fabulous issue of MWB magazine, which has a section dedicated to the trade show Moda – Heart of Fashion and mentions not only Bertoni of Denmark but also our other brand Colours & Sons. To find out more about our AW’16 menswear collections book your appointment with us now!